Our primary goal is to deliver the best and most comprehensive surgical care available. An important part of this is making the cost of optimal care as easy and manageable for our patients as possible. Crystal Lake, Lake Geneva, Huntley and Burlington Oral and Maxillofacial Surgery is an independent practice. We will file all insurance claims on your behalf the day of service and insurance predeterminations can be filed upon request. However, the insurance contract is between the patient and the insurance company. If you have any questions regarding your insurance coverage, deductions, or exclusions you should contact your insurance company directly. To obtain fees prior to surgery, please inform us to schedule an appointment for a consultation so an insurance predetermination can be filed. Payment from insurance carriers will be made directly to our office unless payment in full has been made at the time of service. Any balance after insurance reimbursement is the responsibility of the patient. Typically healthcare providers do not become involved in any dispute of denial or settlement issues. Letters of protection from an attorney do not substitute for a payment plan. We prefer that you pay our office directly when the service is rendered. If this is not possible, please make arrangements prior to treatment. 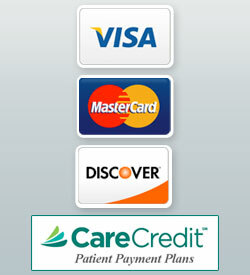 If your insurance company sends additional payment to us, it is immediately forwarded to you. To divorced or separated parents: The parent financially responsible for payment of their child must give written consent and/or payment in advance. The parent bringing the child and signing as the responsible party will be held responsible for the fees. Please bring the completed insurance forms you downloaded or received in the mail, insurance cards and/or insurance numbers at your appointment time. If your insurance company requires predetermination of benefits, a consultation appointment may be necessary. Members of HMOs or similar organizations should notify us prior to your appointment. If you wish to be informed of the fees in advance, please schedule a presurgical consultation appointment. Accurate estimates cannot be given without examining both the patient and the x-rays. We offer a 5% courtesy discount to patients who pay in full the date of service by cash or check on accounts $1000.00 and over. Allows you to pay over time with interest. Convenient, low, monthly payment plans also available. We accept monthly payment for treatments for 90 days. There is a 1% administrative fee for past due accounts over 90 days. Monthly payments are required on all balances.